QuikHiring is a simple to use mobile application designed to bridge recruiters and candidates, enabling them recruiters meet candidates and quickly and effortlessly conduct face to face interviews via their smartphones or tablets. The platform provides recruiters with pre-defined templates for Questions and Answers for each Role and Functional Areas, speeding up the setup process so they can invite candidates for a quick interview almost instantly. QuikHiring is a game changer in terms of finding the right people for the job within the fastest possible time. 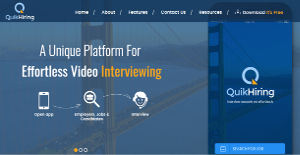 More than just a quick face-to-face video interview solution, QuikHiring expedites the selection process as video introductions effectively replace resumes and videos of potential candidates can be shared instantly to top management for approval and processing. QuikHiring is a mobile recruitment platform that has the potential to change how employers and job seekers meet and come together. Both recruiters and job candidates can definitely take advantage of the application’s capabilities. For recruiters, QuikHiring enables them to find and hire the most qualified candidate. This is because QuikHiring shortens the selection and filtering process with its introduction video functionality that allows candidates to make spiels about themselves. With such feature, candidates have a vehicle they can use to make good impressions about themselves, which in turn, allows recruiters to evaluate and filter candidates based on the communication skills and more. Recruiters can easily set up interviews with candidates who made positive impressions and quickly set their own questions and edit them even during the interview. They can easily share videos of applicants to colleagues and top management for guidance and approval. QuikHiring is also built for job seekers. Candidates will find it easy to download and install the app on their mobile device, whether it’s running on Android or iOS. Login is a breeze as well as they can access the system using their Facebook or Google+ accounts. As mentioned earlier, candidates can create intro videos about themselves and highlight their education, skills sets, and professional goals among others. Aside from sending it to their potential employers, they can also share their videos on social networking sites such as Twitter, Facebook, YouTube, and more, further extending the reach of their videos to other potential employers. What Problems Will QuikHiring Solve? It makes easy to recruiters to review video CV of candidates before calling for a face to face interview. Even job seekers can give face to face interview by video anytime, anywhere. If you are interested in QuikHiring it may also be beneficial to examine other subcategories of Best HR Software collected in our database of SaaS software reviews. Companies have different needs and requirements and no software solution can be ideal in such a situation. It is useless to try to find an ideal off-the-shelf software app that meets all your business needs. The wise thing to do would be to modify the application for your special requirements, employee skill levels, budget, and other aspects. For these reasons, do not rush and pay for well-publicized popular applications. Though these may be widely used, they may not be the ideal fit for your unique wants. Do your groundwork, look into each short-listed system in detail, read a few QuikHiring reviews, contact the maker for explanations, and finally choose the app that provides what you require. How Much Does QuikHiring Cost? QuikHiring doesn’t offer any enterprise pricing plans, as the app is free to download, and available both for iOS and Android devices. We realize that when you make a decision to buy HR Software it’s important not only to see how experts evaluate it in their reviews, but also to find out if the real people and companies that buy it are actually satisfied with the product. That’s why we’ve created our behavior-based Customer Satisfaction Algorithm™ that gathers customer reviews, comments and QuikHiring reviews across a wide range of social media sites. The data is then presented in an easy to digest form showing how many people had positive and negative experience with QuikHiring. With that information at hand you should be equipped to make an informed buying decision that you won’t regret. What are QuikHiring pricing details? What integrations are available for QuikHiring? If you need more information about QuikHiring or you simply have a question let us know what you need and we’ll forward your request directly to the vendor.